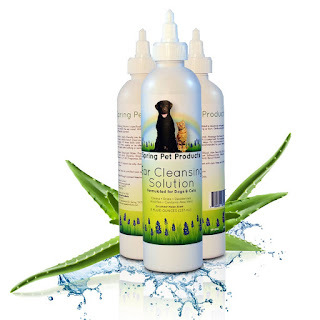 Cleans, acidifies and deodorizes pet's ears. Has a fresh cucumber melon scent to help make ears smell better. 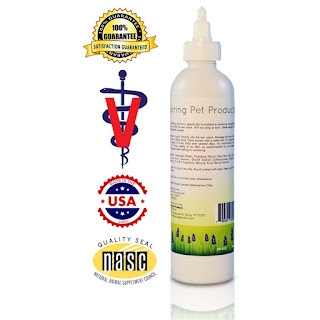 Soothing veterinary strength formula is gentle enough to use every day without stinging. Helps remove the dirt and debris caused by ear mite infestation. 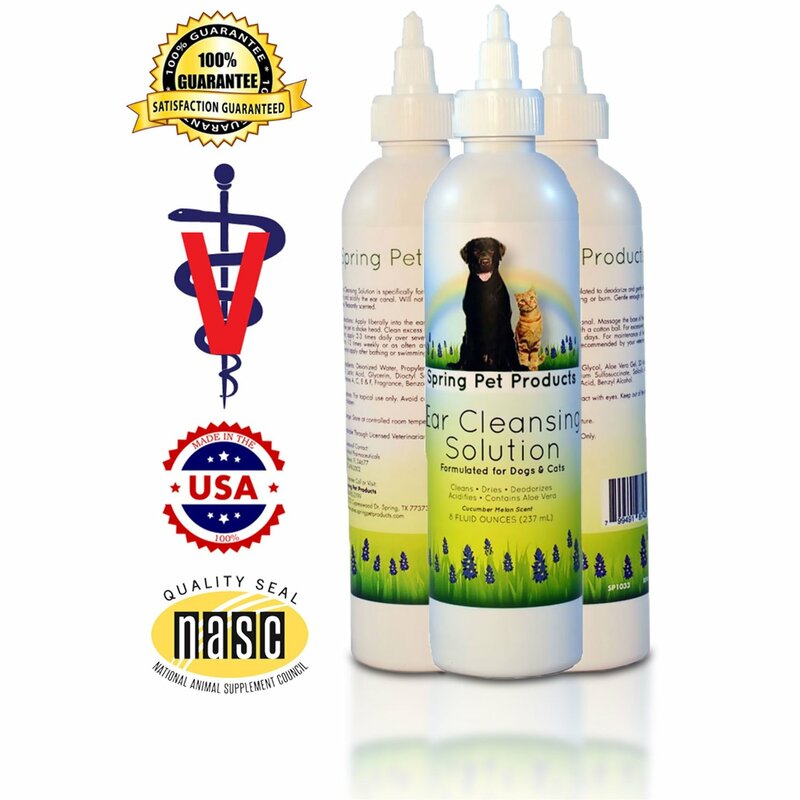 Dries and acidifies the pet's external ear canal which inhibits further growth of harmful micro-organisms, such as yeast and bacteria. Use as needed to clean external ear canal. Can also be used to remove debris prior to administration of prescription otic medications. Ear infections in pets are one of the most common problems seen in both dogs and cats. Parasites, such as ear mites, can irritate the ear and lead to secondary infections. Also, the ear canal in our pets is longer and deeper than ours, which can lead to a warm, dark moist environment that bacteria and yeast love to grow in. Hormonal imbalances and allergies can also lead to problems in your pets ears. Cleaning your pet's ears should be part of your grooming routine to remove excess wax and debris that can harbor these harmful micro-organisms. Our ear cleaner is specifically formulated to deodorize, dry, acidify and gently clean your pet's ears without stinging. Our solution is gentle enough to use every day, after bathing or swimming to help dry the ear. 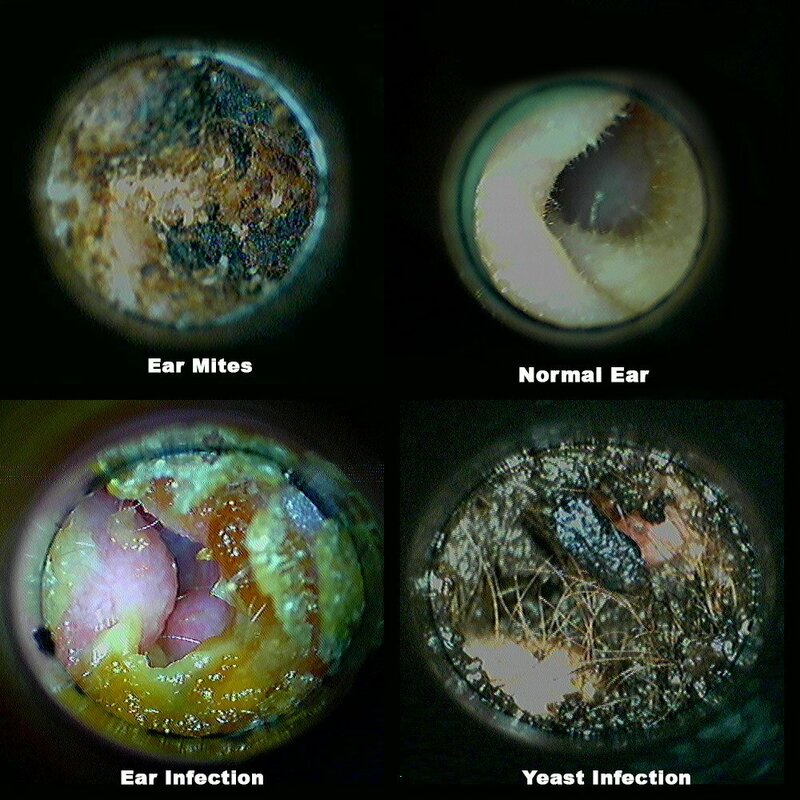 - Fill the ear canal with the ear cleansing solution. - Gently massage the base of the ear to loosen the debris and wax. The ear canal travels downward along your pet's face. You should hear a squishing sound. - Let your pet shake it's head. 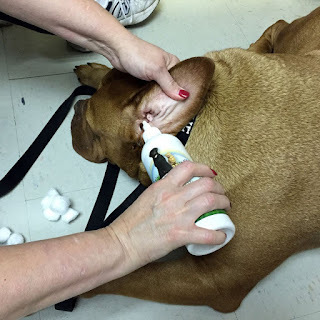 - Clean the ear debris with a cotton ball. Do not use cotton tip swabs down in the ear canal. This tends to pack the debris rather than clean it. For excessively dirty ears you can use 2-3 times a day for several days. For maintenance of healthy ears use once or twice a week or as often as your veterinarian recommends. *If your notice redness, swelling, painful ears, foul odor, or the debris does not resolve after a few days of use, please seek advice of your veterinarian for further diagnostics and treatment. 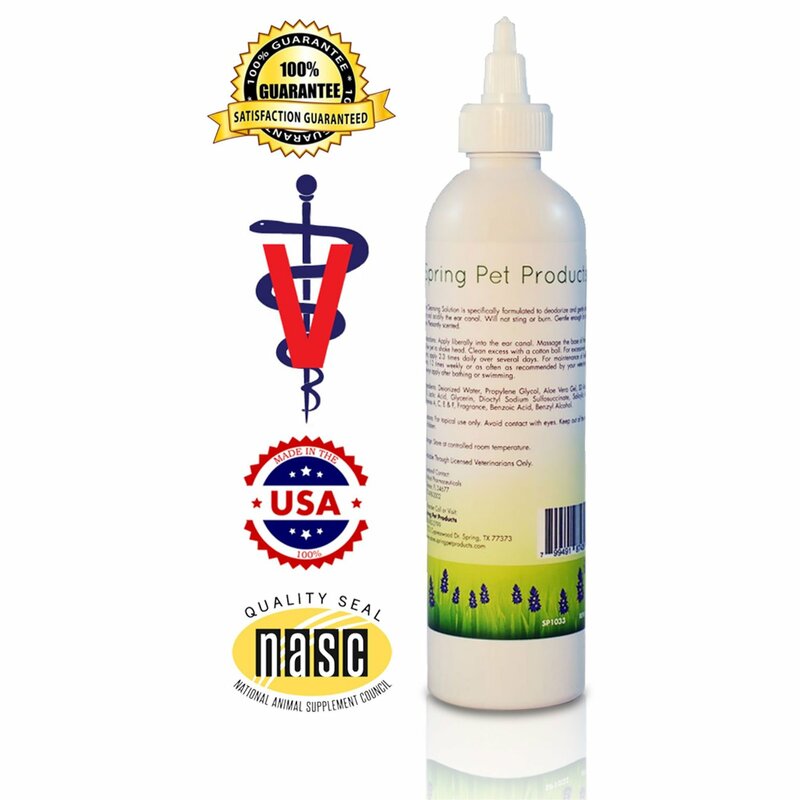 I was happy to get to try Spring Pet Ear Cleaner for Dogs and Cats. We have twin black kittens who are growing up fast. I like to make sure they are growing up healthy and happy. 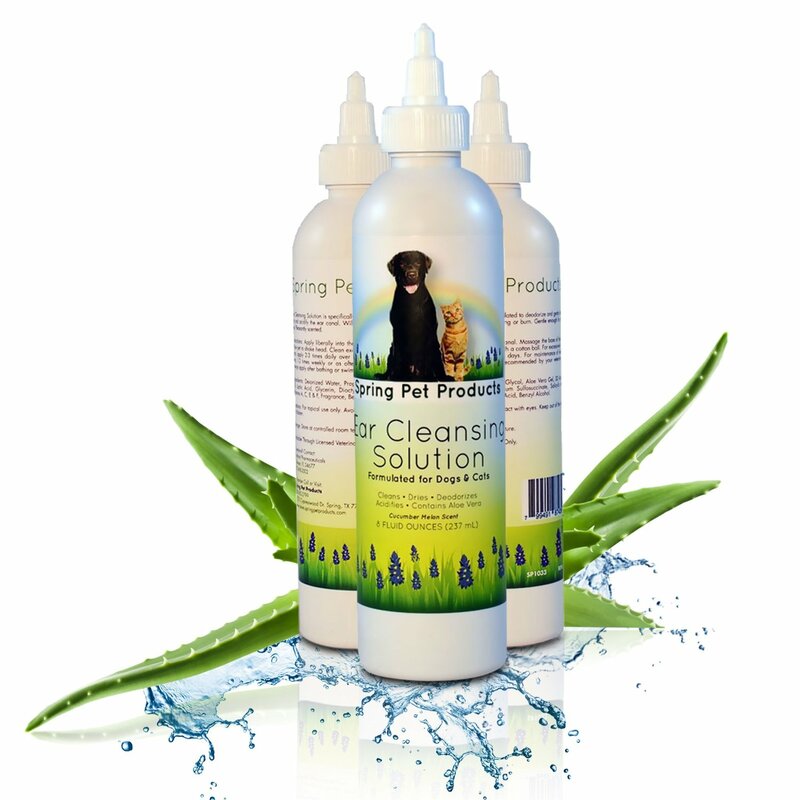 I have been taking care of their ears with this ear cleansing solution. It is easy to apply and they don't mind it very much, they give a head shake when I am done and that is it. As you can see from their pictures, their ears are clean and healthy. I like that this product works well and it takes care of any issues that may be going on in their ears. I use it during regular grooming, when I trim their nails and give them a good brushing. Since I started when they were kittens they don't mind too much and it does not take much time at all. I like that his solution is vet recommended, it has a nice scent and it does not burn or irritate their ears at all. It it easy for me to wipe their ears with a cotton ball afterward with no trouble at all. 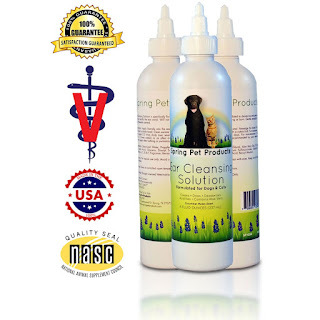 I like that it treats a variety of common ear conditions and I recommend this ear cleaner for dog and cat owners to use while regular grooming to help keep your pets ears healthy and clean.